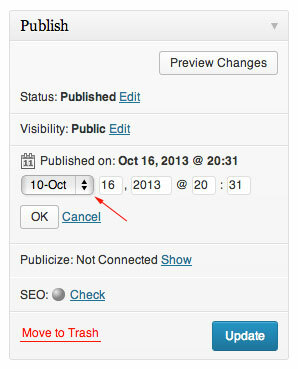 Here’s a super simple tip on how to change the date in WordPress. Two tips actually. The main posts page in the WordPress admin has a nice quick edit feature that allows you to quickly update, among other things, the date the post has been published. Hover over the post name and you’ll find the quick edit button. Change to the desired date and then hit update. 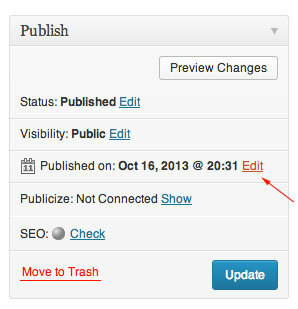 While the quick edit is certainly quicker, there’s also an option to change the post date while editing a post. Find the Publish pane on the right and you’ll see ‘Published on’ as well as an edit link. Clicking that link will allow a quick edit of the date. Hit OK and the next time you update the post the date will also be updated. Thanks for the tutorial. But it didn\’t help. In fact, in my WordPress post it\’s showing \”Schedule\”? Can you please help me to resolve the problem? Sohil, if it\’s saying \’Schedule\’ that means you\’ve changed it to a future post date. Click it and you\’re good to go, brother! Thanks SO much! I wanted to make all my drafts go to the bottom of my post list and your tip helped me do that by backdating the post dates. Appreciate it. Hi Yani. That would be a theme based change. I\’d be happy to take a look at your site and let you know what it would take. I’ve posted a few times on WordPress and backtracked the dates to weeks ago, but the post still comes up as “19 hours ago” on my reader page ?? But it says the publish date when I click on the post ? How do I change it on the reader aswell ?? Hi Brittany. Are you referring to your reader page on WordPress.com or the front side of your own site?